It’s a chronic problem: having the desire, no, the need! to make things and feeling there is never enough time. Between the kids and the business and many important but secret deadlines, I’ve really been feeling stretched thin, and the things I have been craving to make keep getting set aside. I know I’m not alone. So when my friends and co-moderators Stephanie the Late Night Quilterand Kitty the Night Quilter suggested we all give a new idea a try, it seemed likes the perfect chance to do something about it. The idea is super simple, which means it is more likely to work:#sewtake20 is setting your intention to take 20 minutes every day and chip way at something you’ve been wanting to sew. I have so many projects in mind, but few of them are just for us. 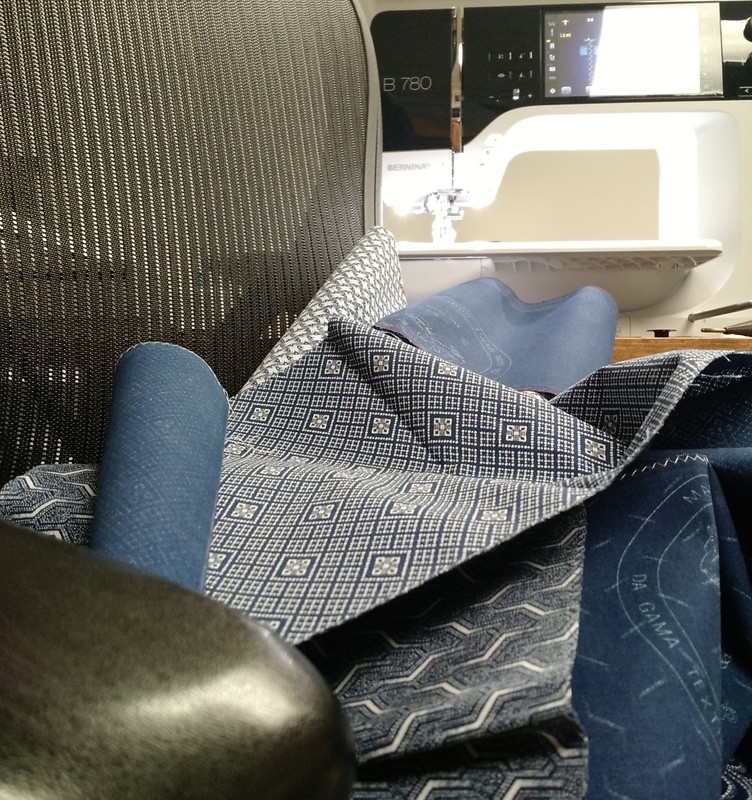 That’s about to change, with my shweshwe fabrics. I got these from Cabin in the Cotton. You can see the contact info in the photo. They’ve been importing these for 16 years! Oh, the shweshwe: Two weeks ago, when my fella was out of town, I decided to tke the kids to the Vermont Quilt Festival. 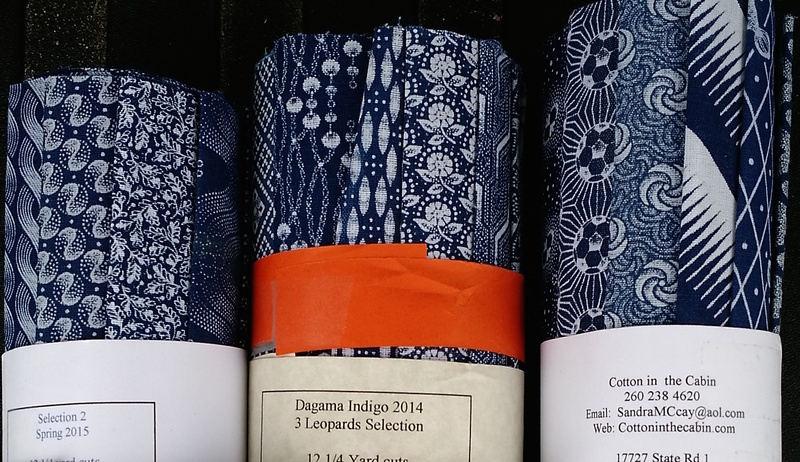 A few years back, I had seen the most amazing collections of this indigo fabrics with complex white prints. Right s I was about to buy them back then, my son had a catastrophic meltdown and we decided to pack it up nd leave. I’ve been dreaming about them ever since, so when I went back (this time with both kids!) I bought what I could and decided to make something just for us. My #sewtake20 experiment starts today, with 20 minutes primarily spent working on this project–a queen-sized quilt for our bed–and maybe throwing some other things in there to mix it up. I am hopeful and excited! I set my timer on my phone and started prepping my pieces for prewashing. The indigo is prone to bleeding and fraying on the edges, so before I put them in the washer, I sewed a zigzag down each side. In 20 minutes, I finished half the pile (about 2 dozen prints! ), and am on my way to getting to the fun bits. Care to join us? We’ll be posting most of our #sewtake20 progress on instagram as @mandaleiquilts @ latenightquilter and @nightquilter although we plan to write up what we’ve learned on our blogs on occasion. You can also see more of these awesome fabrics on my IG feed, where I will be posting one a day until they’re all out there! Love shweshwe, I make all my bags with this beautiful fabric with no problem, you will love your quilt when finished ! I’ve been dreaming about it for years. I’m so excited I can’t even stand it! I didn’t realize you could get shweshwe here. I bought some in Johannesburg in 2012, and I have none left. Cabin in the Cotton is the only place I’ve seen it in the U.S. and they had all the “fancies”, too. They had much more than these, but the project I am working on only needed the straight-up indigos. Sounds like a great idea! I’m in!! Great! post what you’ve got on instagram, and we can all support each other!